In mid-October 2010, a cholera epidemic flared up in Haiti. The epidemic continues, and over 6,000 Haitians have died of the cholera. Until Fall 2010 there had been no record of cholera on the island of Hispaniola. A United Nations (U.N., MINUSTAH) base was discovered to be dumping raw sewage, and it was immediately suspected of being the source of the cholera. Dr. Renaud Piarroux is a major scientific authority on cholera epidemics, an expert in infectious diseases and parasitology. He holds an M.D. in Pediatrics and a Ph.D. in Microbiology, and he is currently a Professor of Parasitology at Aix Marseille University, Marseille, France. He was the lead researcher of a scientific article that tracked Haiti’s cholera contamination to the U.N. MINUSTAH Nepalese military camp upstream of the Artibonite River and its Meille tributary. More details about Dr. Piarroux and his work follow the interview. Dady Chery: Dr. Piarroux, first of all I want to thank you for agreeing to do this interview. Your work is highly respected by scientists the world over. Would you please tell our readers what you do? Renaud Piarroux: I am a specialist in parasitic and infectious diseases, and I’ve specifically studied epidemics that occurred in developing countries. I try to understand how an epidemic can emerge somewhere and how it spreads to neighboring areas. This kind of work is a prerequisite for organizing better to fight against epidemics and to prevent the onset of new outbreaks. In particular, I’ve spent many years studying the dynamics of cholera epidemics in African countries, to provide local sanitary authorities key information to help them set up efficient strategies to fight cholera. DC: Today our discussion is about Haiti’s cholera epidemic. Please tell us what cholera is, a bacterium or a virus. What are the symptoms once the infections occur? How do the infections spread? RP: Cholera is due to the infection of humans by bacteria called Vibrio cholera. The infection happens when somebody ingests these bacteria while drinking, eating, or putting soiled hands in his or her mouth. The cholera symptoms depend on the amounts of bacteria that a person ingests. If, for example, a person ingests a limited number of bacteria, this provokes no symptom or only mild diarrhea. But if he ingests a large amount of bacteria, this can provoke severe diarrhea, vomiting and rapid dehydration that can lead to death within a few hours to a few days. The severity of the disease also depends on the patient. In malnourished or weak individuals the amount of bacteria necessary to provoke a severe disease is lower than in other subjects. DC: Haiti’s first cholera epidemic began in mid-October 2010, and since then we’ve seen a resurgence. Can you tell our readers something about the socio-political nature of this epidemic? How does it differ politically from other epidemics you’ve studied? Does this epidemic present political problems for scientists? RP: I don’t know what you mean by socio-political nature of this epidemic. Obviously, when a deadly epidemic occurs in a given territory, many consequences can be expected, and some of them may call out the political authorities of the country. In Haiti in particular, the severity of the epidemic and the fact that the germ was brought there by Nepalese soldiers belonging to MINUSTAH, led to many political problems. However, I was appointed to investigate this epidemic, and this includes how it started. I decided to do the job regardless of the political issues. DC: How can geophysical disasters like Haiti’s terrible January 2010 earthquake contribute to infectious diseases like cholera? RP: There is no link between geophysical disasters (earthquakes, tsunamis and volcano eruptions) and cholera epidemics. I know that media reports almost always stress the risk for epidemics after such disasters and that many “experts” regularly warn about epidemic risks every time an earthquake or a tsunami devastates an area. In 2005, we analyzed the medical literature and all the reports made by humanitarian agencies and by the World Health Organization from 1985 to 2004. Our objective was to identify the outbreaks detected during the months after these geophysical disasters. Of more than 600 geophysical disasters recorded, we found only 3 that reported limited outbreaks related to these disasters and no cholera outbreak. The cholera epidemic in Haiti is the first one that occurred in an area damaged by an earthquake since more than 15 years! In addition, remember that in Haiti, the cholera epidemic started in an area spared by the earthquake and was less severe in the camps of internally displaced people than everywhere else. By contrast with geophysical disaster, I acknowledge that meteorological disasters, such as floods, are sometimes associated with cholera epidemics, but I repeat that this is not the case after earthquakes. DC: Dr. Piarroux, how is cholera transmitted in a population? Can it be transmitted by casual contact between people? How is transmission of a mild cholera infection different than transmission of a severe or even lethal infection? RP: People get sick by ingesting a high amount of the bacteria. This can be provoked by close contact with somebody suffering from cholera, but it’s easy to protect oneself from this kind of transmission by good hygiene. This is why medical staff rarely get ill despite the fact that they have numerous contacts with people suffering from cholera. By contrast, transmission among relatives is frequent in the household of a patient. The other way of transmission is through contaminated food or water. The severest infections are usually in people who had ingested a lot of bacteria in highly contaminated drinking water. DC: Is information about the severity of the disease important for epidemiology? RP: Indeed it is. For example, a large number of severe cases that occur simultaneously should direct the investigation to a common source of contamination, which is generally a soiled water resource that was used for drinking and other domestic activities. By contrast, human to human transmission of cholera needs a lot more time to reach a large number of people. In this case, the epidemic is generally less severe, with most people presenting mild or moderate symptoms, and it takes weeks to reach the epidemic peak. DC: What circumstances brought you to Haiti to do your study? RP: In response to a request from the Haitian Ministry of Health and Population, I was appointed by the French ambassador to go there. I went to Haiti to provide medical and scientific support to the Haitian Ministry of Health to help understand the dynamics of the cholera epidemic. DC: What kinds of problems or barriers did you run into from people or organizations when you conducted your work in Haiti? Please tell us about the level of freedom you had to do your work there. RP: I had no problem doing my work in Haiti. I could go where I needed, except in the MINUSTAH’s camps. I could only have a short talk with some military doctors from MINUSTAH in the presence of their chiefs. DC: Dr. Piarroux, how did you gain access to the medical records about the cholera cases and who assisted you with this? RP: Except for the medical records of the Nepalese soldiers, which were not made available, I could get access to the epidemiological records of all the patients hospitalized in the health facilities as well as to all the results of stool samples sent to the national laboratory. I never worked alone. I was assisted by epidemiologists from the ministry of health in collecting the data coming from the Haitian health facilities. DC: Who were the Haitian scientists and medical authorities who participated in the epidemiological study and how were they able to assist you? RP: Two Haitians contributed to the study as authors: Drs. Robert Barrais and Roc Magloire. Dr. Barrais is an epidemiologist in the National Laboratory of Public Health. Dr. Magloire is the director of this institution. I proposed to other Haitian epidemiologists and Haitian medical authorities to be co-authors of the paper, but they declined my offer. I think that, even though they agreed with the study, they were afraid of possible retaliation. DC: How important were their contributions to the success of your study? RP: They collected almost all the pieces of the puzzle that I reconstructed with them. Their contribution was capital: you cannot do a good investigation in a foreign country without a strong collaboration with local epidemiologists. DC: Dr. Piarroux, we know it’s very important for studies like yours to be published in scientific journals so that other scientists get to refute your findings or benefit from them and build on them. What was your experience with getting your study in Haiti published in these journals? How does this compare with epidemiological studies you’ve done in other parts of the world? RP: We tried to complete the study as fast as possible, and we submitted a first version to a scientific journal called “The Lancet” [a leading medical journal, in the U.K.] in December 2010. However the paper was rejected without any explanation. At the same time, the Lancet Infectious Diseases published an editorial entitled “As cholera returns to Haiti, blame is unhelpful.” Even if our study was not aiming to blame but to understand what really happened in Haiti, I believe this was too sensitive a political issue for The Lancet. It’s clear that they were afraid to publish our findings. Consequently, we lost time and had to find another editor. This is why I contacted the editors of Emerging Infectious Diseases Journal, which is the journal of the American Centers for Diseases Control and Prevention. They were excessively cautious with our manuscript. Normally two or three scientific reviewers are needed for a paper. In this case, five scientific reviewers were involved in the reviewing process, asking many complementary details and additional statistics. Finally all the reviewers considered that we had adequately answered their questions, and the editorial board accepted to publish the study in May 2011, just at the moment when another report from the U.N. was made available. DC: May was also when Martelly was inaugurated as Haiti’s new president after elections that had been partly organized by the U.N. So Dr. Piarroux, we could have had your results as early as December 2010, two months after the start of the epidemic. What are the findings from this research? In other words, what are the main conclusions reached from this study? RP: Our epidemiological study provides strong arguments confirming an importation of cholera into Haiti. There was an exact correlation in time and place between the arrival of a Nepalese battalion from an area experiencing a cholera outbreak and the appearance of the first cases in Meille a few days later. The remoteness of Meille village in central Haiti and the absence of any report of other visitors make it very unlikely that a cholera strain might have been brought there another way. Since our publication, another study demonstrated that the strains isolated in Haiti and in Nepal are almost completely identical. Put together, the two studies provide the most accurate scientific approach ever used to investigate a given epidemic, and they demonstrate without any doubt that cholera was brought to Haiti by infected Nepalese soldiers. DC: Your results imply that there had been active cases of cholera on the UN base on the Artibonite River. Please tell us more about this? How does the Artibonite River come into play and why is it important? RP: Maybe at the beginning, when the soldiers left Nepal they were asymptomatic. The risk of transmission associated with asymptomatic carriage is well known, but asymptomatic patients typically shed low amounts of bacteria in their stool and, by definition, present no diarrhea. This small level of shedding would have been rapidly diluted in the stream flowing near the Nepalese camp and nobody in its neighborhood would have been contaminated. It should be mentioned that high doses are required to provoke severe infections. We therefore believe that symptomatic cases should have occurred inside the MINUSTAH camp to lead to high level of bacteria leaking from the UN base and contaminating the stream. DC: Along with some of my reports on Axis of Logic, we‘ve published photographs of tank trucks dumping raw sewage taken directly from the Nepalese camp. How could this contamination be spread through the river causing an epidemic of this magnitude? The Artibonite is a pretty big river: nearly 320 kilometers (200 miles) long with an average width of about 59 meters (65 yards). Wouldn’t the bacteria or virus have been diluted by such a large volume of water? RP: In our study we calculated that, to reach the concentrations of bacteria capable of provoking diarrhea in people drinking the water, one cubic meter of diarrheic stools should have been spilled into the water of the Artibonite River or its tributaries. I recognize that this is a rough calculation because no one knows exactly what dose should be ingested to cause disease in a healthy subject. Some ethically highly questionable studies were carried out on volunteers in the 70's. These studies showed that the first symptoms appeared after ingestion of 10,000 bacteria mixed with a solution for neutralizing stomach acid. There is, of course, no question of re-testing to refine these numbers and determine from how many ingested bacteria severe infections might occur. Nevertheless, taking into account the importance of the flow of the Artibonite River, one realizes quickly that it took a massive amount of vibrios discharged into the water to cause the health disaster that was activated from the 19th of October 2010 in the delta of the Artibonite. The epidemic curve shows that in just a few hours, several thousand people became contaminated. Among them, several hundred died within a few days. DC: Was the UN helpful or how did it hinder you regarding your access to the health records of the Mirebalais Nepalese UN troops? RP: We never got access either to the health records of Nepalese soldiers or to the results of the samples that were collected by the U.N. To my knowledge, nobody could get this information except U.N. officials. It would have been very interesting to test the soldiers (none of them has been tested) and to examine how the analyses to find the germ in the camp and in the stream near the camp were done. Searching for the germ of cholera in environmental samples requires specific methods and skills, and I was never able to verify if these analyses were correctly done. DC: When were the first cholera infections identified. In other words, when did we first know for a fact that Haitians were infected with cholera? RP: On October 21st when the first sample was cultured from a patient. DC: And when were the UN Nepalese identified as the source of the cholera? RP: Some journalists fingered the U.N. camp near Mirebalais in late October 2010. At the end of November, I confirmed this hypothesis in my report [A draft of this report was leaked in the web in December.]. Then my definitive report was published in May 2011, and the results of the genotyping [DNA sequencing] of the Nepalese strains were published in August. 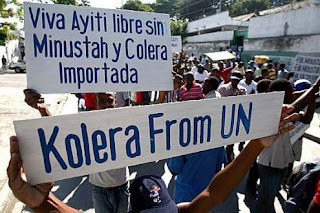 However, you know that the U.N. still denies that cholera was brought into Haiti by its peacekeepers. DC: Indeed. In fact, there are reports that the U.N. recently dumped its untreated wastes into the Guayamouc River near the town of Hinche. http://www.guardian.co.uk/commentisfree/cifamerica/2011/sep/11/haiti-unitednations-minustah-cholera Since you’ve already explained that active cases of cholera occurred in the U.N. Mirebalais base, it stands to reason that the U.N. should have known about the source of the cholera before any of us did. Anyway Dr. Piarroux, it’s my understanding that within a couple of weeks after the outbreak in October 2010, the CDC showed that the cholera infections from three Haitians were identical. RP: The fact that the cholera samples from three Haitian patients were identical to each other only showed that these people were infected with the same strain. This is very frequent during an epidemic. This was only a first step, and not a decisive one, to progress towards the knowledge about the origin of the epidemic. DC. Couldn’t the CDC have got hold of cholera DNA from Nepal back then and compared it to the cholera DNA from Haitians? The recent sequencing study suggests that one type of cholera from Nepal is so identical to the one in Haiti that if the CDC had done this comparison, they would not have been able to tell what was Haitian from what was Nepalese. RP: I’m not sure that the Nepalese cholera strains were made available at that time, but I have no specific information on this. Even without this, the source of the epidemic was obvious even in October 2010. For instance, take a look at the map illustrating the first report from PAHO published on October 22nd. http://reliefweb.int/node/371964 Looking at this map, you easily understand that the cholera epidemic should have started upstream, in Mirebalais. DC: It’s my impression that Haiti’s cholera initially spread very rapidly? Did you find the initial spread of the cholera in Haiti to be similar to epidemics you had observed before, or was this one exceptionally fast moving? RP: This epidemic was exceptionally fast moving. For instance the first peak of the epidemic in Lower Artibonite was reached on October 21st, with more than 2,000 new cases and almost 100 new deaths. This was only two days after the first cases came to the hospitals of this area! This is the first time I saw this. Even in the refugees camp in Goma, Zaïre in 1994, it took more time to reach the epidemic peak (the epidemic started in mid July and reached a peak after two weeks). Everywhere else it needed several weeks, or even months to hit so many cases. The exceptional severity of the start of the cholera epidemic in Haiti was due to the fact that thousands of people had simultaneously become contaminated on October 19th by drinking water drawn from the Artibonite. The epidemic was so deadly that people who saw their friends and relatives dying tried to escape to other areas and disseminated the germ in numerous municipalities of Haiti. Once again, I never saw an epidemic spread as fast as the cholera in Haiti during October 2010. DC: Many of us have seen John Snow’s map of London’s 1854 cholera epidemic. In this map, the epidemic looks more focused with an epicenter spreading to the immediate area around it. How was the cholera outbreak in Haiti different, even during its early days? RP: The difference is that, instead of a pump, it was a river that delivered the contaminated water that simultaneously reached dozens of thousands people. It was therefore a much larger area that was simultaneously hit during the first days of the epidemic in Haiti. DC: My experience from growing up in Haiti is that poor people collect their drinking water from pipes, springs, or wells, even if they have to travel far for it. Nowadays, of course, a lot of bottled drinking water is distributed by NGOs and other organizations, but ordinarily people do not drink river water although they routinely bathe and wash their clothes in it. Before the epidemic, many people complained of becoming sick from some of the bottled water that was being distributed around. What is the possibility that cholera was spread among the population through bottled river water, or water that was passed out in blue plastic bags called “dlo nen saché”? RP: The first available records show that most of the patients hospitalized during the first days of the epidemic in the lower Artibonite had drunk water from the river (Centers for Disease Control and Prevention. Update: cholera outbreak—Haiti, 2010. MMWR Morb Mortal Wkly Rep. 2010;59:1473–9.). I went into the rice field near Saint Marc and was able to confirm by interviewing people that they were in the habit of drinking the water from the river or the canals when they were working in the fields. In Mirebalais, the problem was a little bit different: there’s a water supply network there, but it was being repaired at the time, and people had to draw their water from the stream coming from the Nepalese camp. Water in bags (dlo nen saché) is commonly sold in the main towns but much more rarely in the fields. Since it’s impossible to know where the sellers get the water, it ‘s considered very risky to drink such kinds of water. Therefore if some people collected water from the river to sell it, water in bags could have played a role in spreading the epidemic. However, during the first days of the epidemic, the main role in causing the infections was played by the stream near the Nepalese camp, then by the Artibonite River and the canals that irrigate the coastal plain of the Lower Artibonite. DC: Some prisoners who were more or less isolated from the infected population died of cholera very early on. What is the possibility – or probability that they were infected by water given to them by their custodians? RP: Based on an epidemiological study done in October: the water supply network was out of order at that time, and so they were given the water from the stream. DC: On October 25th, the director of Haiti's Health Department, Gabriel Timothe, publicly announced that the water in "dlo nen saché" should not be trusted. Were there any early cases of the cholera that could not be explained by a proximity to the Artibonite River but might be explained by a distribution of river water as purified water? RP: I agree with Gabriel Thimothe that dlo nen saché shouldn’t be trusted. However, from October 14th (date of symptom onset for the first case found in Meille, near the Nepalese camp), to October 21st, only populations living near the Artibonite River and its tributaries were affected by the epidemic. Then the cholera spread to various communities due to the flight of contaminated people out of the already hit areas. It ‘s therefore very difficult to say what role these “water in bags” played. My opinion is that they played only a minor role. DC: If untreated Artibonite River water was being distributed, how do you think this would have influenced the epidemic? RP: For the areas far away from the river, it’s impossible to tell if the disease was brought by contaminated water or by contaminated people. I went to some of these areas, and I interviewed many people about the first cases of cholera in their villages and towns. It seems that the most common way the cholera spread was by the arrival of ill people from an affected area. I’ve no specific argument to attribute the spread of the epidemic to a specific network of bottled-water distribution. DC: As you know, Dr. Piarroux, the cholera epidemic has nearly wiped out the little bit that was left of Haiti’s domestic rice production. Is it possible to get cholera from bathing in contaminated river water or wading in a rice paddy? How about eating rice grown in contaminated water? RP: When you eat rice, it has been dried then boiled for cooking. The bacteria cannot survive such treatment. When I was in Haiti, I frequently ate the delicious local Haitian rice. Hot rice is not an “at risk” type of food during an epidemic. DC: Almost one year later, there are still 1,000 cases of cholera per month, and Haitians are still dying of this. Why is the epidemic not disappearing? RP: There are many more than 1,000 cases of cholera per month. Currently, a few hundreds new cases are recorded daily, corresponding to more than 10,000 cases per month. The epidemic is still around now because numerous cases occurred in remote rural areas that were not taken enough into account by the organizations involved in the fight against the cholera. Even though some NGOs as well as the Cuban medical brigades tried to track cases in the rural communities, the efforts have been insufficient to limit the spread of cholera from one village to another. So when the rainy season came, there were still some active foci of the cholera and the epidemic was able to reemerge from these foci to spread again in the main Haitian towns. When a fire rages in the forest, firefighters work to extinguish it completely and then watch closely for any recurrence of the fire. We must do the same with cholera epidemics. Otherwise, when favorable conditions return, the outbreaks resume. Unfortunately in the case of the cholera in Haiti, when the epidemic appeared to have calmed down, it was still there. And instead of continuing the efforts to end it permanently, the cholera workers relaxed their efforts and many of them left. DC: One possible source of endemic cholera is the waste from hospitals and clinics. Is there any reason to suspect that some health facilities in Haiti are not properly treating their wastes before disposing of them? RP: Yes this risk is real, but currently I have no information about this issue. DC: There is a fear that the cholera will reach the groundwater. Can infectious cholera survive in groundwater? RP: Generally, cholera is transmitted by surface water, and groundwater remains protected. Concerning Haiti, I have no specific information about results of groundwater testing; maybe you can interview specialized engineers from water supply companies? DC: Thank you for this suggestion. Dr. Piarroux, Dr. John Andrus from PAHO in the U.N. has announced that the epidemic will last for years and there will many more deaths. How reasonable is this assumption? RP: The duration of a cholera epidemic depends mostly on how you fight it. If you really want the epidemic to end, you can manage it. DC: PAHO’s John Andrus and others like Harvard’s Drs. John Mekalanos and Paul Farmer are saying that vaccines are urgently needed. What is your opinion on this? RP: The fact is that there’s not enough vaccine in the world to immunize more than five percent of the Haitian population. You will never stop an epidemic by immunizing only five percent of the population. In addition many studies have showed that wastewater treatment and clean drinking water are the most important tools to control a cholera epidemic. DC: Cholera epidemics used to be common in Europe, and now they are completely gone. What do you think would be needed to wipe out Haiti’s epidemic? If drinking contaminated water is the main source of cholera, what would be involved in eliminating contamination of Haiti’s water? In the meantime, what should be done to protect Haitians from the water that is contaminated? Are these realistic objectives? RP: The epidemics did not disappear spontaneously from Europe at the end of the nineteen century. They were wiped out by improving access to safe water, especially in the main cities such as London and Paris. The same is needed in Haiti. Ten million people cannot live in a such a small area without some proactive policy planning to ensure that the wastewater gets treated and they get access to drinking water that does not endanger their health. These objectives were realistic in Europe in the 19th century, why shouldn’t they be in Haiti in the 21st century? DC: I realize that the nature of my next question is both scientific and political and you, of course, are a scientist. But you have experience in both arenas. Can you give us your opinion about what the U.N. might do to make amends to Haitians and repair the damage it has done with the cholera? 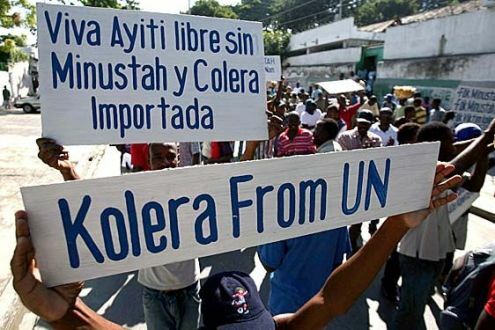 RP: Considering the circumstances that led to the cholera epidemic and the serious consequences for Haitians and Dominicans, the U.N. could make the decision to eliminate cholera totally from the island and do this as quickly as possible. I know that the problem is complex but it does not seem insoluble to me. For starters, if the U.N. really wants to find a solution, it should take the advice of those who’ve spent months fighting against the epidemic and studying how it works. For my part, I would be happy to participate in an international discussion on how to eliminate the cholera from Haiti, but so far no one has proposed this to me. DC: Is there anything more you'd like to share with the public? RP : For me, the fight against cholera outbreaks is similar to a battle. The better one knows the enemy one is fighting, the better the chance of vanquishing him. This is why I put so much importance on the truth not being distorted. But winning a battle is also mental, if we start out losing and thinking that we'll never get there, we will have very little chance of success. Cholera thrives on this sort of defeatism. DC: Thank you very much Dr. Piarroux for generously agreeing to this interview and sharing with us your time, expertise, and the truth about this epidemic. We appreciate the quality of your science and your courage as a scientist to conduct difficult work under very demanding circumstances. Professor of Parasitology Renaud Piarroux specializes in infectious and tropical diseases. He holds an M.D. in pediatrics and a Ph.D. in microbiology, he works as both a medical practitioner and a researcher in the area of epidemics and endemic tropical diseases. He directs the public health Department of Parasitology and Mycology (teaching hospital) of Marseille and teaches tropical and parasitic diseases at Aix-Marseille University. In parallel, he participates in fighting epidemics in developing countries (Sub-Saharan Africa, Comoroes, Middle-East, Central America). He has done numerous epidemiological assessments (epidemiological risks after natural disasters, parasitic diseases, cholera and plague outbreaks) for the World Health Organization (WHO), the French ministry of foreign affairs as well as several NGOs. He has participated in humanitarian missions in Croatia (1993), Zaïre, (refugees camps in Goma, 1994), Afghanistan (1995), Rwanda (1996), Honduras (Hurricane Mitch, 1998), Albania (1999), Comoros (9 missions from 1995 to 2000, including management of a cholera epidemic), Ivory Coast (1997-2001), and the Democratic Republic of Congo (Goma after eruption of Nyiragongo Volcano, Katanga, Bandundu 2002-2003). Since 2005, he has been assisting the Congolese Ministry of Public Health with drawing up and implementing a program against cholera in the Democratic Republic of Congo. In November 2010 he was invited by the Haitian government to investigate the country's explosive cholera outbreak and showed that the start of the epidemic was linked to a U. N. blue-helmet camp with deficient sanitation. Understanding the cholera epidemic, Haiti. Piarroux R, Barrais R, Faucher B, Haus R, Piarroux M, Gaudart J, Magloire R, Raoult D. Emerg Infect Dis. 2011 Jul;17(7):1161-8. The Haitian cholera epidemic: is searching for its origin only a matter of scientific curiosity? Faucher B, Piarroux R. Clin Microbiol Infect. 2011 Apr;17(4):479-80. Cholera epidemics, war and disasters around Goma and Lake Kivu: an eight-year survey. Bompangue D, Giraudoux P, Piarroux M, Mutombo G, Shamavu R, Sudre B, Mutombo A, Mondonge V, Piarroux R. PLoS Negl Trop Dis. 2009;3(5):e436. Epub 2009 May 19. Lakes as source of cholera outbreaks, Democratic Republic of Congo. Bompangue D, Giraudoux P, Handschumacher P, Piarroux M, Sudre B, Ekwanzala M, Kebela I, Piarroux R. Emerg Infect Dis. 2008 May;14(5):798-800. Negligible risk for epidemics after geophysical disasters. Floret N, Viel JF, Mauny F, Hoen B, Piarroux R. Emerg Infect Dis. 2006 Apr;12(4):543-8.